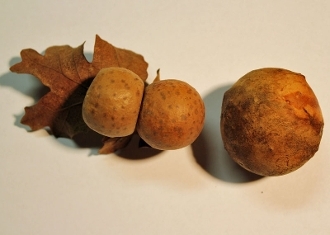 These oak galls measure about 3/4 inch to 1 inch across and are sometimes referred to as oak apples. These are simply galls--plant material caused by an allergic reaction by the plant to defend itself against the laying of an egg in its stem by a wasp. The galls are kept frozen and may or may not contain the larval or adult parasitic wasp within. Read more about oak galls at Bugguide.Net.